Tbe French theme Park Puy du Fou has been voted “Best Theme Park in the World” at the Thea Award Ceremony of the “International Asssociation of Amusement Parks and Attractions” in Los Angeles. The Vendée park, is to be found between La-Roche-sur-Yon and Angers, was chosen ahead of 700 parks in 40 countries. This is not a typical theme park with hair raising rides, but we thoroughly enjoyed the spactular “arena shows” which the park puts on to tell the history of the Vendeen region. Visitors can watch performances starring Roman gladiators, swashbuckling musketeers, marauding Vikings and fantastic swooping birds. We all had a different favourite show but they are all fantastic and well rehearsed.There is a new show this year to celebrate the parc’s 35th Anniversary and I believe this show will feature acrobatics on horseback ! 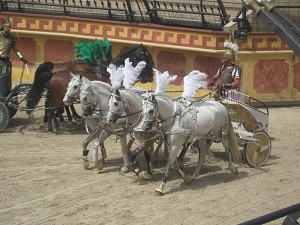 There is also, of course, the famous night show at the park, “la Cinescenie”, which features numerous horses and a cast of hundreds.